If you are a small business, a larger business or, a major corporation, this is the social media bible for you and every single person in your employ. Whereas Crush It! is the bible for individuals with the entrepreneurial spirit seeking to implement social media, The Thank You Economy is the guidebook for companies that need to be using social media correctly. The book defines the new rules of engagement when it come to establishing and maintaining relationships with customers via social media platforms; counters arguments against using social media in and for the workplace; makes general recommendations about incorporating social media into your company and; provides examples of how this works for different kinds of businesses. The core message of the book is that companies need to engage all of their customers in a personal and meaningful way that is made possible by the social media platforms that are now available. This book is absolutely invaluable for anyone who seeks to utilize social media in business and; also for any business that thinks that social media is irrelevant. Gary Vaynerchuk’s enthusiasm is as famous/infamous as it is infectious. He is brilliant but; for the uninitiated, his passion can be startling. In the middle of the audio, there is a certain amount of fatigue and; less extemporizing on the part of Gary Vaynerchuk that seems to settle in – all of which seems in contrast to his normal hyperactive style and makes for a certain uneven feel to the overall production. Regardless, only Gary Vaynerchuk can narrate this material because, in a way, it’s very much his story, his memoir. Gary Vaynerchuk eats, sleeps and breathes this stuff and, needless to say practices what he preaches. 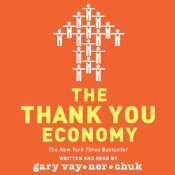 Other Stuff: I received a digital dnload copy of The Thank You Economy upon request from Harper Audio, Inc.
Gary Vaynerchuk spoke at APAC/BEA in NYC (in May) and my boss, Josh Stanton, attended the packed/SRO event. I’m not exactly sure what Gary said in his speech, but Josh came back charged with enthusiasm for social media. Upon his return to Ashland, OR, Josh approached me with a vague proposal about me handling social media for the company I work for (Blackstone Audio, Inc.) and encouraged me to read Gary Vaynerchuk’s book, CRUSH IT! I actually dnloaded the book from audible (it’s not an audio that our company carries – and no, the irony does not escape me there) and I have to tell you that I’m pretty sure Josh would not have recommended this book if he had actually read it himself! This is not a handbook for corporate types seeking to get rich quick using Facebook and Twitter. It is, however, a guide encouraging individuals to consider using the many social media platforms at their disposal to recreate their identities in the business world by hewing closer to their own passions. Crush It! is, in equal parts, autobiographical, informational and motivational. The audiobook chronicles the success of Gary Vaynerchuk’s endeavor to promote wine via social media tools (check out tv.winelibrary.com) and the correlative success of his family’s discount liquor store. Success stories such as Mr. Vaynerchuk’s are essential to the promotion of the book’s premise to prove that he isn’t blowing smoke up your chimney. He is the living proof that the approach works. The information that should be gleaned from Crush It! is not about the specific social media platforms that Gary Vaynerchuk used in his success story (“do what speaks to your DNA!” and, moreover the specific platforms that he used may be passé by the time you get around to launching your own social media campaign,) but the overall business strategy of using social media to sculpt your identity in the business world. Gary Vaynerchuk inspires the listener to abandon traditional (and soon to be obsolete) business models and practices, to work on branding yourself, to monetize your passion and to go on to live a happier and enriched life. Listen to the audiobook, but don’t get too caught up in taking notes. There is an Appendix A near the end of the book that you can transcribe if you need to.